Personal care compositions comprising a cleansing phase and a benefit phase. These products are intended to provide a multi-phase personal care composition that is packaged in physical contact while remaining stable and providing improved in-use and after-use hair and skin benefits. This application claims the benefit of U.S. Provisional Application No. 60/617,392 filed on Oct. 8, 2004, the disclosure of which is incorporated herein in its entirety by reference. The present invention relates to personal care compositions comprising a cleansing phase and an aqueous benefit phase. These products are intended to provide a multi-phase personal care composition that is packaged in physical contact while remaining stable and providing improved in-use and after-use hair and skin benefits. Personal care compositions containing detersive surfactants and cationic polymers to improve deposition of conditioning oils capable of imparting conditioning or smoothness properties to surfaces treated therewith are known in the art. In addition to compositions that provide conditioning benefits, there are also compositions known in the art that provide other benefits such as coloring, styling, and a variety of hair health benefits. However, the level of additional benefits these compositions provide fall short of consumer expectations. In addition, when a benefit agent is included in a cleansing product, the amount of lather generated is reduced. One attempt at providing multiple benefits (conditioning, coloring, styling, hair health) from a personal care product, while maintaining cleansing and high lather, has been the dual-chamber packaging. These packages comprise separate cleansing compositions and benefit compositions and allow for co-dispensing of the two in a single or dual stream. The separate benefit and cleansing compositions remain physically separate and stable during prolonged storage and just prior to application, then mix during or after dispensing to provide conditioning and cleansing benefits from a physically stable system. Although such dual-chamber delivery systems provide improved consumer benefits over the use of conventional systems, it is often difficult to achieve consistent and uniform performance because of the uneven dispensing ratio between the cleansing phase and the benefit phase from these dual chamber packages. Additionally, these packaging systems add considerable cost to the finished product. Accordingly, the need still remains for personal care compositions that provide multiple benefits delivered from good cleansing products. The need also remains for personal care compositions comprising two or more phases in physical contact that remain stable. It is an object of the present invention to provide a multi-phase personal care composition comprising at least one cleansing phase and at least one aqueous benefit phase that are visually distinct phases that are packaged in physical contact and maintain stability, and the compositions provide improved in-use and after-use hair benefits. The present invention is directed to a multi-phase personal care composition comprising at least one cleansing phase comprising at least one surfactant and at least one thickener; and at least one aqueous benefit phase comprising at least one thickener and at least one benefit agent selected from the group consisting of styling polymers, silicones, crosslinked silicone elastomers, peralkylene hydrocarbons, and hair coloring agents/dyes; wherein said cleansing phase and said benefit are visually distinct phases that are packaged in physical contact and maintain stability. Benefit agents are useful in providing benefits including, but not limited to, enhanced perfume delivery, conditioning, foam, styling, hair volumizing, hair shine, hair coloring, hair moisturizing, hair health enhancing benefits. The multi-phase personal cleansing compositions of the present invention comprise a first phase comprising a lathering cleansing phase, and at least one separate additional phase comprising a non-lathering structured aqueous phase. The non-lathering structured aqueous phase can be hydrophilic and in a preferred embodiment the non-lathering structured aqueous phase can be a hydrophilic gelled water phase. These and other essential limitations of the compositions and methods of the present invention, as well as many of the optional ingredients suitable for use herein, are described in detail hereinafter. All percentages, parts and ratios are based upon the total weight of the compositions of the present invention, unless otherwise specified. All such weights as they pertain to listed ingredients are based on the active level and, therefore do not include solvents or by-products that may be included in commercially available materials, unless otherwise specified. The term “weight percent” may be denoted as “wt. %” herein. By the term “visually distinct,” as used herein, is meant that the regions occupied by each phase can be separately seen by the human eye as distinctly separate regions in contact with one another (i.e. they are not emulsions or dispersions of particles of less than about 100 microns). By the term “visibly clear” as used herein, is meant that the transmission of the composition is greater than 60%, preferably greater than 80%. The transparency of the composition is measured using Ultra-Violet/Visible (UV/VIS) Spectrophotometry, which determines the absorption or transmission of UV/VIS light by a sample. A light wavelength of 600 nm has been shown to be adequate for characterizing the degree of clarity of cosmetic compositions. Typically, it is best to follow the specific instructions relating the specific spectrophotometer being used. In general, the procedure for measuring percent transmittance starts by setting the spectrophotometer to the 600 nm. Then a calibration “blank” is run to calibrate the readout to 100 percent transmittance. The test sample is then placed in a cuvette designed to fit the specific spectrophotometer and the percent transmittance is measured by the spectrophotometer at 600 nm. By the term “multi-phased” or “multi-phase” as used herein, is meant that at least two phases occupy separate and distinct physical spaces inside the package in which they are stored, but are in direct contact with one another (i.e., they are not separated by a barrier and they are not emulsified). In one preferred embodiment of the present invention, the “multi-phased” personal care compositions comprising at least two phases are present within the container as a visually distinct pattern. The pattern results from the mixing or homogenization of the “multi-phased” composition. The patterns include but are not limited to the following examples: striped, marbled, rectilinear, interrupted striped, check, mottled, veined, clustered, speckled, geometric, spotted, ribbons, helical, swirl, arrayed, variegated, textured, grooved, ridged, waved, sinusoidal, spiral, twisted, curved, cycle, streaks, striated, contoured, anisotropic, laced, weave or woven, basket weave, spotted, and tessellated. Preferably the pattern is selected from the group consisting of striped, geometric, marbled, and combinations thereof. In a preferred embodiment the striped pattern may be relatively uniform and even across the dimension of the package. Alternatively, the striped pattern may be uneven, i.e. wavy, or may be non-uniform in dimension. The striped pattern does not need to necessarily extend across the entire dimension of the package. The phases may be various different colors, or include particles, glitter or pearlescence. The term “charge density”, as used herein, refers to the ratio of the number of positive charges on a monomeric unit of which a polymer is comprised to the molecular weight of said monomeric unit. The charge density multiplied by the polymer molecular weight determines the number of positively charged sites on a given polymer chain. The term “water soluble” as used herein, means that the component is soluble in water in the present composition. In general, the component should be soluble at about 25° C. at a concentration of about 0.1% by weight of the water solvent, preferably at about 1%, more preferably at about 5%, even more preferably at about 15%. The term “stable” as used herein, unless otherwise specified, refers to compositions in which the visible pattern or arrangement of the phases in different locations in the package is not significantly changing overtime when sitting in physical contact at ambient conditions for a period of at least about 180 days. In addition, it is meant that no separation, creaming, or sedimentation occurs. By “separation” is meant that the well-distributed nature of the visually distinct phases is compromised, such that larger regions of at least one phase collect until the balanced dispensed ratio of the two or more compositions relative to each other is compromised. The term “personal care composition” as used herein, unless otherwise specified, refers to the compositions of the present invention, wherein the compositions are intended to include only those compositions for topical application to the hair or skin, and specifically excludes those compositions that are directed primarily to other applications such as hard surface cleansing, fabric or laundry cleansing, and similar other applications not intended primarily for topical application to the hair or skin. The personal care compositions and methods of the present invention can comprise, consist of, or consist essentially of, the essential elements and limitations of the invention described herein, as well as any additional or optional ingredients, components, or limitations described herein or otherwise useful in personal care compositions intended for topical application to the hair or skin. The present invention relates to personal care compositions comprising a cleansing phase and a benefit phase. These products are intended to provide a multi-phase personal care composition that is packaged in physical contact while remaining stable and providing improved in-use and after-use hair and skin benefits. In the present invention, the cleansing phase, the benefit phase, or both the cleansing phase and the benefit phase may be visibly clear. Alternatively, one of the phases is visibly clear and the other phase is opaque. The compositions of the present invention preferably have a pH of from about 2 to about 8.5, more preferably from about 3 to about 7.5, even preferably from about 3.5 to about 6.5. Preferably, the ratio of the cleansing phase to the benefit phase is from about 10:1 to about 1:10. Other ratios of the cleaning phase to the benefit phase are contemplated by the present invention. The cleansing phase exhibits a high viscosity, but it is highly shear thinning. The viscosities of the cleansing phase and the benefit phase are in the range of from about 10,000 centipoise to about 200,000,000 centipoise at stress measurements from about 1 to about 20 pascals, more preferably from about 100,000 to about 100,000,000 centipoise at stress measurements from about 1 to about 20 pascals. A Haake RS 150 RheoStress Rheometer may be used to determine the viscosity of the phases. The measurements are made under controlled stress conditions from about 1 pascal to about 500 pascals. A 60 mm parallel plate geometry with a plate gap size of about 0.75 mm is used for measurements. All measurements are taken at about 25° C.
Under appropriate composition, the cleansing phase can form lamellar or vesicle structures. Both lamellar and vesicle structures are considered liquid crystalline and are birefringent. Birefringent materials appear bright between cross-polarizers under an optical microscope. The personal care compositions of the present invention comprise a cleansing phase that comprises at least one surfactant and at least one thickener. The cleansing phase may additionally comprise any component listed in the benefit phase section herein or any component listed in the optional ingredient section herein. Preferably, the cleansing phase is present in an amount of from about 5% to about 95%, preferably from about 10% to about 90%, and more preferably from about 20% to about 80% by weight of the composition. The cleansing phase of the present invention comprises at least one surfactant. Suitable surfactants for use herein include any known or otherwise effective cleansing surfactant which is suitable for application to the hair or skin, and which are otherwise compatible with the other essential ingredients in the cleansing phase of the compositions. The cleansing phase of the composition comprises at least one cleansing phase comprising at least one surfactant selected from the group consisting of anionic surfactants, nonionic surfactants, zwitterionic surfactants, amphoteric surfactants, cationic surfactants, soap, and mixtures thereof. Suitable surfactants are described in McCutcheon's, Emulsifiers and Detergents 1989 Annual, published by M. C. Publishing Co., and in U.S. Pat. No. 3,929,678. The cleansing phase of the personal care compositions typically comprises a cleansing surfactant at concentrations ranging from about 4% to about 50%, more preferably from about 9% to about 30%. The surfactant may be present in an amount of at least 4% by weight of the composition of the cleansing phase, preferably at least about 9%. The preferred pH range of the cleansing phase is from about 5 to about 8, more preferably about 6. Anionic surfactants suitable for use as cleansing surfactant in the cleansing phase of the present compositions include alkyl and alkyl ether sulfates. These materials have the respective formula ROSO3M and RO(C2H4O)xSO3M, wherein R is an alkyl or alkenyl of from about 8 to about 24 carbon atoms, x is from about 1 to about 10, and M is a water-soluble cation such as ammonium, magnesium, sodium, potassium, or triethanolamine. The alkyl ether sulfates are typically made as condensation products of ethylene oxide and monohydric alcohols having from about 8 to about 24 carbon atoms. Preferably, R has from about 10 to about 18 carbon atoms in both the alkyl and alkyl ether sulfates. The alcohols can be derived from fats, e.g., coconut oil or tallow, or can be synthetic. Lauryl alcohol and straight chain alcohols derived from coconut oil are preferred herein. Such alcohols are reacted with about 1 to about 10, preferably from about 2 to about 5, and more preferably with about 3, molar proportions of ethylene oxide and the resulting mixture of molecular species having, for example, an average of 3 moles of ethylene oxide per mole of alcohol, is sulfated and neutralized. Specific examples of alkyl ether sulfates which may be used in the cleansing phase are sodium and ammonium salts of coconut alkyl triethylene glycol ether sulfate; tallow alkyl triethylene glycol ether sulfate, and tallow alkyl hexaoxyethylene sulfate. Highly preferred alkyl ether sulfates are those comprising a mixture of individual compounds, said mixture having an average alkyl chain length of from about 10 to about 16 carbon atoms and an average degree of ethoxylation of from about 1 to about 4 moles of ethylene oxide. Other suitable anionic surfactants include water-soluble salts of the organic, sulfuric acid reaction products of the general formula [R1—SO3-M], wherein R1 is chosen from the group consisting of a straight or branched chain, saturated aliphatic hydrocarbon radical having from about 8 to about 24, preferably from about 10 to about 18, carbon atoms; and M is a cation. Suitable examples are the salts of an organic sulfuric acid reaction product of a hydrocarbon of the methane series, including iso-, neo-, ineso-, and n-paraffins, having about 8 to about 24 carbon atoms, preferably about 10 to about 18 carbon atoms and a sulfonating agent, e.g., SO3, H2SO4, obtained according to known sulfonation methods, including bleaching and hydrolysis. Preferred are alkali metal and ammonium sulfonated C10-18 n-paraffins. Preferred anionic surfactants for use in the cleansing phase include ammonium lauryl sulfate, ammonium laureth sulfate, triethylamine lauryl sulfate, triethylamine laureth sulfate, triethanolamine lauryl sulfate, triethanolamine laureth sulfate, monoethanolamine lauryl sulfate, monoethanolamine laureth sulfate, diethanolamine lauryl sulfate, diethanolamine laureth sulfate, lauric monoglyceride sodium sulfate, sodium lauryl sulfate, sodium laureth sulfate, potassium laureth sulfate, sodium lauryl sarcosinate, sodium lauroyl sarcosinate, lauryl sarcosine, cocoyl sarcosine, ammonium cocoyl sulfate, ammonium lauroyl sulfate, sodium cocoyl sulfate, sodium lauroyl sulfate, potassium cocoyl sulfate, potassium lauryl sulfate, monoethanolamine cocoyl sulfate, sodium tridecyl benzene sulfonate, sodium dodecyl benzene sulfonate, and combinations thereof. Anionic surfactants with branched alkyl chains such as sodium trideceth sulfate, for example, are preferred in some embodiments. Mixtures of anionic surfactants can be used in some embodiments. Amphoteric surfactants suitable for use as cleansing surfactant in the cleansing phase of the present compositions include those that are broadly described as derivatives of aliphatic secondary and tertiary amines in which the aliphatic radical can be straight or branched chain and wherein one of the aliphatic substituents contains from about 8 to about 18 carbon atoms and one contains an anionic group, e.g., carboxy, sulfonate, sulfate, phosphate, or phosphonate. Examples of compounds falling within this definition are sodium 3-dodecyl-aminopropionate, sodium 3-dodecylaminopropane sulfonate, sodium lauryl sarcosinate, N-alkyltaurines such as the one prepared by reacting dodecylamine with sodium isethionate according to the teaching of U.S. Pat. No. 2,658,072, N-higher alkyl aspartic acids such as those produced according to the teaching of U.S. Pat. No. 2,438,091, and the products described in U.S. Pat. No. 2,528,378. Zwitterionic surfactants suitable for use as cleansing surfactant in the cleansing phase include those that are broadly described as derivatives of aliphatic quaternary ammonium, phosphonium, and sulfonium compounds, in which the aliphatic radicals can be straight or branched chain, and wherein one of the aliphatic substituents contains from about 8 to about 18 carbon atoms and one contains an anionic group, e.g., carboxy, sulfonate, sulfate, phosphate, or phosphonate. Cationic surfactants can optionally be used in the cleansing phase, and preferably represent less than about 5%, by weight of the cleansing phase. Nonionic surfactants for use in the compositions of the present invention are disclosed in McCutcheon's, Detergents and Emulsifiers, North American edition (1986), published by allured Publishing Corporation; and McCutcheon's, Functional Materials, North American Edition (1992). Nonionic surfactants useful herein include those selected from the group consisting of alkyl glucosides, alkyl polyglucosides, polyhydroxy fatty acid amides, alkoxylated fatty acid esters, lathering sucrose esters, amine oxides, and mixtures thereof. Non-limiting examples of preferred nonionic surfactants for use herein are those selected form the group consisting of C8-C14 glucose amides, C8-C14 alkyl polyglucosides (decyl polyglucoside) (APG 325, Henkel); lauryl polyglucoside (APG 600CS, Henkel), sucrose cocoate, sucrose laurate, and mixtures thereof. In a preferred embodiment the nonionic surfactant is selected from the group consisting of glyceryl monohydroxystearate, Steareth-2, hydroxy stearic acid, propylene glycol stearate, PEG-2 stearate, sorbitan monostearate, glyceryl stearate, laureth-2 and mixtures thereof. In a preferred embodiment the nonionic surfactant is Steareth-2. Other suitable non-ionic surfactants are Surfadone LP-100 and Surfadone LP-300 from International Specialty Products. The cleansing phase of the present invention comprises at least one thickener. Preferred thickeners are selected from the group consisting of inorganic water thickeners, polymeric thickeners, additives that promote thickening via lamellar structuring of surfactants, organic crystalline thickeners, and mixtures thereof. The thickener in the present invention can be hydrophilic. The amount of thickener present may be less than about 20%, preferably less than about 10%, and even more preferably less than about 5%. Non-limiting examples of inorganic water thickeners for use in the personal care composition include silicas, clays such as a synthetic silicates (Laponite XLG and Laponite XLS from Southern Clay), or mixtures thereof. Non-limiting examples of polymeric thickeners for use in the personal care composition include Acrylates/Vinyl Isodecanoate Crosspolymer (Stabylen 30 from 3V), Acrylates/C10-30 Alkyl Acrylate Crosspolymer (Pemulen TR1 and TR2), Carbomers (Aqua SF-1), Ammonium Acryloyldimethyltaurate/VP Copolymer (Aristoflex AVC from Clariant), Ammonium Acryloyldimethyltaurate/Beheneth-25 Methacrylate Crosspolymer (Aristoflex HMB from Clariant), Acrylates/Ceteth-20 Itaconate Copolymer (Structure 3001 from National Starch), Polyacrylamide (Sepigel 305 from SEPPIC), Non-ionic thickener, (Aculyn 46 from Rohm and Haas), or mixtures thereof. Additional non-limiting examples of polymeric thickeners for use in the personal care composition include cellulosic gel, hydroxypropyl starch phosphate (Structure XL from National Starch), polyvinyl alcohol, or mixtures thereof. Further, non-limiting examples of polymeric thickeners for use in the personal care composition include synthetic and natural gums and thickeners such as xanthan gum (Ketrol CG-T from CP Kelco), succinoglycan (Rheozan from Rhodia), gellum gum, pectin, alginates, starches including pregelatinized starches, modified starches, or mixtures thereof, acrylates/aminoacrylates/CD-30 alkyl PEG-20 itaconate copolymer (Structure Plus from National Starch). Non-limiting examples of additives that promote thickening via lamellar structuring of surfactants for use in the personal care composition include fatty amides, fatty alcohols, fatty acid or ester derivatives thereof, electrolytes, and mixtures thereof. Examples of fatty acids which may be used are C10-C22 acids such as the following: lauric acid, oleic acid, isostearic acid, linoleic acid, linolenic acid, ricinoleic acid, elaidic acid, arichidonic acid, myristoleic acid, palmitoleic acid, and the like. Ester derivatives include propylene glycol, isostearate, propylene glycol oleate, glyceryl isostearate, glyceryl oleate, polyglyceryl diisostearate, and the like. Non-limiting examples of organic crystalline thickeners for use in the personal care composition include ethylene glycol esters of fatty acids preferably having from about 16 to about 22 carbon atoms. Other long chain acyl derivatives include long chain esters of long chain fatty acids (e.g., stearyl stearate, cetyl palmitate, etc. ); long chain esters of long chain alkanol amides (e.g., stearamide diethanolamide distearate, stearamide monoethanolamide stearate); and glyceryl esters (e.g., glyceryl distearate, trihydroxystearin, tribehenin) a commercial example of which is Thixin R available from Rheox, Inc. Other suitable thickeners are alkyl (C16 to C22) dimethyl amide oxides such as stearyl dimethyl amine oxide. Also useful herein are long chain acyl derivatives, ethylene glycol esters of long chain carboxylic acids, long chain amine oxides, and alkanol amides of long chain carboxylic acids. The personal care compositions of the present invention comprise at least one benefit phase. The benefit phase comprises at least one thickener and at least one benefit agent selected from the group consisting of styling polymers, silicones, crosslinked silicone elastomers, peralkylene hydrocarbons, and hair coloring agents/dyes. The benefit phase may further comprise benefit agents selected from the group consisting of anti-dandruff actives, humectants, water soluble nonionic polymers, cationic polymers, conditioning agents, and particles. Benefit agents are useful in providing for enhanced perfume delivery, enhanced cleaning, hair coloring, hair styling, hair moisturizing, hair health enhancing, hair shine enhancing, hair volumizing, etc. Preferably, the benefit phase is present in an amount of from about 5% to about 95%, preferably from about 10% to about 90%, and more preferably from about 20% to about 80% by weight of the composition. The benefit phase of the personal care compositions comprises a thickener. Thickeners useful in the benefit phase are the same as those described in the cleansing phase section. The thickeners can be the same or different types and can be at the same levels or different levels in the two phases. The compositions of the present invention comprise at least one benefit agent. Benefit agents are selected from the group consisting of styling polymers, silicones, crosslinked silicone elastomers, peralkylene hydrocarbons, and hair coloring agents/dyes. The benefit phase may further comprise benefit agents selected from the group consisting of anti-dandruff actives, humectants, water soluble nonionic polymers, cationic polymers, conditioning agents, and particles. The compositions of the present invention may comprise a styling polymer. The compositions hereof will generally comprise from about 0.1% to about 15%, preferably from 0.5% to about 8%, more preferably from about 1% to about 8%, by weight of the composition, of the styling polymer. It is not intended to exclude the use of higher or lower levels of the polymers, as long as an effective amount is used to provide adhesive or film-forming properties to the composition and the composition can be formulated and effectively applied for its intended purpose. These styling polymers provide the composition of the present invention with hair styling performance by providing polymeric deposits on the hair after application. The polymer deposited on the hair has adhesive and cohesive strength and delivers styling primarily by forming welds between hair fibers upon drying, as is understood by those skilled in the art. Many such polymers are known in the art, including water-soluble and water-insoluble organic polymers and water-insoluble silicone-grafted polymers, all of which are suitable for use in the composition herein, provided that they also have the requisite features or characteristics described hereinafter. Such polymers can be made by conventional or otherwise known polymerization techniques well known in the art, an example of which includes free radical polymerization. The styling polymer should have a weight average molecular weight of at least about 20,000, preferably greater than about 25,000, more preferably greater than about 30,000, most preferably greater than about 35,000. There is no upper limit for molecular weight except that which limits applicability of the invention for practical reasons, such as processing, aesthetic characteristics, ability to formulate, etc. In general, the weight average molecular weight will be less than about 10,000,000, more generally less than about 5,000,000, and typically less than about 2,000,000. Preferably, the weight average molecular weight will be between about 20,000 and about 2,000,000, more preferably between about 30,000 and about 1,000,000, and most preferably between about 40,000 and about 500,000. Suitable silicone grafted polymers are also disclosed in EPO Application 90307528.1, published as EPO Application 0 408 311 A2 on Jan. 11, 1991, Hayama, et al., U.S. Pat. No. 5,061,481, issued Oct. 29, 1991, Suzuki et al., U.S. Pat. No. 5,106,609, Bolich et al., issued Apr. 21, 1992, U.S. Pat. No. 5,100,658, Bolich et al., issued Mar. 31, 1992, U.S. Pat. No. 5,100,657, Ansher-Jackson, et al., issued Mar. 31, 1992, U.S. Pat. No. 5,104,646, Bolich et al., issued Apr. 14, 1992, U.S. Ser. No. 07/758,319, Bolich et al, filed Aug. 27, 1991, and U.S. Ser. No. 07/758,320, Torgerson et al., filed Aug. 27, 1991. Suitable cationic polymers include Polyquaternium-4 (Celquat H-100; L200—supplier National Starch); Polyquaternium-10 (Celquat SC-240C; SC-230 M—supplier National Starch); (UCARE polymer series—JR-125, JR-400, LR-400, LR-30M, LK, supplier Amerchol); Polyquaternium-11 (Gafquat 734; 755N—supplier ISP); Polyquaternium-16 (Luviquat FC 370; FC550; FC905; HM-552 supplier by BASF); PVP/Dimethylaminoethylmethacrylate (Copolymer 845; 937; 958—-ISP supplier); Vinyl Caprolactam/PVP/Dimethylaminoethyl Methacrylate copolymer (Gaffix VC-713; H2 OLD EP-1—supplier ISP); Chitosan (Kytamer L; Kytamer PC—supplier Amerchol); Polyquaternium-7 (Merquat 550—supplier Calgon); Polyquaternium-18 (Mirapol AZ-1 supplied by Rhone-Poulenc); Polyquaternium-24 (Quatrisoft Polymer LM-200—supplier Amerchol); Polyquaternium-28 (Gafquat HS-100—supplier ISP); Polyquaternium-46 (Luviquat Hold—supplier BASF); and Chitosan Glycolate (Hydagen CMF; CMFP—supplier Henkel); Hydroxyethyl Cetyldimonium Phosphate (Luviquat Mono CP—supplier BASF); and Guar Hydroxylpropyl Trimonium Chloride (Jaguar C series-13S, -14S, -17, -162, -2000, Hi-CARE 1000—supplier Rhône-Poulenc). Suitable amphoteric polymers include Octylacrylmide/Acrylates/Butylaminoethyl Methacrylate Copolymer (Amphomer 28-4910, Amphomer LV-71 28-4971, Lovocryl-47 28-4947—National Starch supplier), and Methacryloyl ethyl betaine/methacrylates copolymer (Diaformer series supplier Mitsubishi). Polymers which are partially zwitterionic are also useful. They possess a positive charge over a broad range of pH but contain acidic groups which are only negatively charged at basic pH. The polymer is positively charged at lower pH and neutral (have both negative and positive charge) at higher pHs. The zwitterionic polymer may be selected from cellulose derivatives, wheat derivatives and chitin derivatives such as are known in the art. Nonlimiting examples of zwitterionic polymers useful herein include Polyquaternium-47 (Merquat 2001—supplier Calgon (a zwitterionic copolymer of acrylic acid, methacryl amido propyl trimethyl ammonium chloride, and methyl acrylate)); Carboxyl Butyl Chitosan (Chitolam NB/101—marketed by Pilot Chemical Company, developed by Lamberti); and Dicarboxyethyl Chitosan (N-[(3′-hydroxy-2′,3′-dicarboxy)ethyl]-beta-D-(1,4)-glucosamine) (available from Amerchol as, e.g., CHITOLAM NB/101). Useful nonionic polymers include PVP or Polyvinylpyrrolidone (PVP K-15, K-30, K-60, K-90, K-120—supplier ISP) (Luviskol K series 12, 17, 30, 60, 80, & 90—supplier BASF); PVP/VA (PVP/VA series S-630; 735, 635, 535, 335, 235—supplier ISP) (Luviskol VA); PVP/DMAPA acrylates copolymer (Styleze CC-10—supplier ISP); PVP/VA/Vinyl Propionate copolymer (Luviskol VAP 343 E, VAP 343 I, VAP 343 PM—supplier BASF); Hydroxylethyl Cellulose (Cellosize HEC—supplier Amerchol); and Hydroxylpropyl Guar Gum (Jaguar HP series-8, -60, -105, -120—supplier Rhône-Poulenc). A wide variety of natural, semi-natural, and synthetic styling polymers are useful herein, see suitable styling polymers in encyclopedia of polymers and thickeners, Cosmetic & Toiletries, Volume 117, No. 12, December 2002, pages 67-120. The compositions of the present invention may comprise a silicone. The silicone is preferably an insoluble silicone conditioning agent. The silicone conditioning agent particles may comprise volatile silicone, non-volatile silicone, or combinations thereof. Preferred are non-volatile silicone conditioning agents. If volatile silicones are present, it will typically be incidental to their use as a solvent or carrier for commercially available forms of non-volatile silicone materials ingredients, such as silicone gums and resins. The silicone conditioning agent particles may comprise a silicone fluid conditioning agent and may also comprise other ingredients, such as a silicone resin to improve silicone fluid deposition efficiency or enhance glossiness of the hair. The concentration of the silicone conditioning agent typically ranges from about 0.01% to about 10%, preferably from about 0.1% to about 8%, more preferably from about 0.1% to about 5%, more preferably from about 0.2% to about 3%. Non-limiting examples of suitable silicone conditioning agents, and optional suspending agents for the silicone, are described in U.S. Reissue Pat. No. 34,584, U.S. Pat. Nos. 5,104,646, and 5,106,609. The silicone conditioning agents for use in the compositions of the present invention preferably have a viscosity, as measured at 25° C., from about 20 to about 2,000,000 centistokes (“csk”), more preferably from about 1,000 to about 1,800,000 csk, even more preferably from about 50,000 to about 1,500,000 csk, more preferably from about 100,000 to about 1,500,000 csk. The dispersed silicone conditioning agent particles typically have a number average particle diameter ranging from about 0.01 μm to about 50 μm. For small particle application to hair, the number average particle diameters typically range from about 0.01 μm to about 4 μm, preferably from about 0.01 μm to about 2 μm, more preferably from about 0.01 μm to about 0.5 μm. For larger particle application to hair, the number average particle diameters typically range from about 4 μm to about 50 μm, preferably from about 6 μm to about 30 μm, more preferably from about 9 μm to about 20 μm, more preferably from about 12 μm to about 18 μm. Silicone fluids include silicone oils, which are flowable silicone materials having a viscosity, as measured at 25° C., less than 1,000,000 csk, preferably from about 5 csk to about 1,000,000 csk, more preferably from about 100 csk to about 600,000 csk. Suitable silicone oils for use in the compositions of the present invention include polyalkyl siloxanes, polyaryl siloxanes, polyalkylaryl siloxanes, polyether siloxane copolymers, and mixtures thereof. Other insoluble, non-volatile silicone fluids having hair conditioning properties may also be used. wherein R is aliphatic, preferably alkyl or alkenyl, or aryl, R can be substituted or unsubstituted, and x is an integer from 1 to about 8,000. Suitable R groups for use in the compositions of the present invention include, but are not limited to: alkoxy, aryloxy, alkaryl, arylalkyl, arylalkenyl, alkamino, and ether-substituted, hydroxyl-substituted, and halogen-substituted aliphatic and aryl groups. Suitable R groups also include cationic amines and quaternary ammonium groups. Preferred alkyl and alkenyl substituents are C1 to C5 alkyls and alkenyls, more preferably from C1 to C4, more preferably from C1 to C2. The aliphatic portions of other alkyl-, alkenyl-, or alkynyl-containing groups (such as alkoxy, alkaryl, and alkamino) can be straight or branched chains, and are preferably from C1 to C5, more preferably from C1 to C4, even more preferably from C1 to C3, more preferably from C1 to C2. As discussed above, the R substituents can also contain amino functionalities (e.g. alkamino groups), which can be primary, secondary or tertiary amines or quaternary ammonium. These include mono-, di- and tri-alkylamino and alkoxyamino groups, wherein the aliphatic portion chain length is preferably as described herein. wherein R2 is hydrogen, phenyl, benzyl, or a saturated hydrocarbon radical, preferably an alkyl radical from about C1 to about C20, and A− is a halide ion. wherein R3 is a monovalent hydrocarbon radical from C1 to C18, preferably an alkyl or alkenyl radical, such as methyl; R4 is a hydrocarbon radical, preferably a C1 to C18 alkylene radical or a C10 to C18 alkyleneoxy radical, more preferably a C1 to C8 alkyleneoxy radical; Q− is a halide ion, preferably chloride; r is an average statistical value from 2 to 20, preferably from 2 to 8; s is an average statistical value from 20 to 200, preferably from 20 to 50. A preferred polymer of this class is known as UCARE SILICONE ALE 56™, available from Union Carbide. Other silicone fluids suitable for use in the compositions of the present invention are the insoluble silicone gums. These gums are polyorganosiloxane materials having a viscosity, as measured at 25° C., of greater than or equal to 1,000,000 csk. Silicone gums are described in U.S. Pat. No. 4,152,416; Noll and Walter, Chemistry and Technology of Silicones, New York: Academic Press (1968); and in General Electric Silicone Rubber Product Data Sheets SE 30, SE 33, SE 54 and SE 76. Specific non-limiting examples of silicone gums for use in the compositions of the present invention include polydimethylsiloxane, (polydimethylsiloxane) (methylvinylsiloxane) copolymer, poly(dimethylsiloxane) (diphenyl siloxane)(methylvinylsiloxane) copolymer and mixtures thereof. Other non-volatile, insoluble silicone fluid conditioning agents that are suitable for use in the compositions of the present invention are those known as “high refractive index silicones,” having a refractive index of at least about 1.46, preferably at least about 1.48, more preferably at least about 1.52, more preferably at least about 1.55. The refractive index of the polysiloxane fluid will generally be less than about 1.70, typically less than about 1.60. In this context, polysiloxane “fluid” includes oils as well as gums. Preferred high refractive index polysiloxane fluids have a combination of phenyl or phenyl derivative substituents (more preferably phenyl), with alkyl substituents, preferably C1-C4 alkyl (more preferably methyl), hydroxy, or C1-C4 alkylamino (especially —R1NHR2NH2 wherein each R1 and R2 independently is a C1-C3 alkyl, alkenyl, and/or alkoxy). When high refractive index silicones are used in the compositions of the present invention, they are preferably used in solution with a spreading agent, such as a silicone resin or a surfactant, to reduce the surface tension by a sufficient amount to enhance spreading and thereby enhance the glossiness (subsequent to drying) of hair treated with the compositions. Silicone fluids suitable for use in the compositions of the present invention are disclosed in U.S. Pat. Nos. 2,826,551, and 3,964,500, and 4,364,837, British Pat. No. 849,433, and Silicon Compounds, Petrarch Systems, Inc. (1984). Silicone resins may be included in the silicone conditioning agent of the compositions of the present invention. 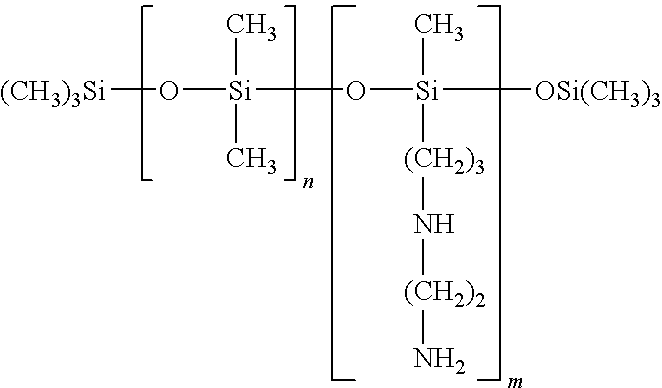 These resins are highly cross-linked polymeric siloxane systems. The cross-linking is introduced through the incorporation of trifunctional and tetrafunctional silanes with monofunctional or difunctional, or both, silanes during manufacture of the silicone resin. Silicone materials and silicone resins in particular, can conveniently be identified according to a shorthand nomenclature system known to those of ordinary skill in the art as “MDTQ” nomenclature. Under this system, the silicone is described according to presence of various siloxane monomer units which make up the silicone. Briefly, the symbol M denotes the monofunctional unit (CH3)3SiO0.5; D denotes the difunctional unit (CH3)2SiO; T denotes the trifunctional unit (CH3)SiO1.5; and Q denotes the quadra- or tetra-functional unit SiO2. Primes of the unit symbols (e.g. M′, D′, T′, and Q′) denote substituents other than methyl, and must be specifically defined for each occurrence. Preferred silicone resins for use in the compositions of the present invention include, but are not limited to MQ, MT, MTQ, MDT and MDTQ resins. Methyl is a preferred silicone substituent. Especially preferred silicone resins are MQ resins, wherein the M:Q ratio is from about 0.5:1.0 to about 1.5:1.0 and the average molecular weight of the silicone resin is from about 1000 to about 10,000. The personal care compositions of the present invention may comprise crosslinked silicone elastomers. Crosslinked silicone elastomers are present in an amount of from about 0.01% to about 15%, preferably from about 0.1% to about 10%, even more preferably from about 1% to about 5% by weight of the composition. These benefit agents provide hair alignment and softness (emollient) benefits to hair. Preferred compositions are dimethicone/vinyl dimethicone crosspolymers. Such dimethicone/vinyl dimethicone crosspolymers are supplied by a variety of suppliers including Dow Corning (DC 9040 and DC 9041), General Electric (SFE 839), Shin Etsu (KSG-15, 16, 18 [dimethicone/phenyl vinyl dimethicone crosspolymer]), Grant Industries (Gransil™ line of materials), and lauryl dimethicone/vinyl dimethicone crosspolymers supplied by Shin Etsu (e.g., KSG-31, KSG-32, KSG-41, KSG-42, KSG-43, and KSG-44). Cross-linked organopolysiloxane elastomers useful in the present invention and processes for making them are further described in U.S. Pat. Nos. 4,970,252; and 5,760,116; and 5,654,362; and Japanese Patent Application JP 61-18708, assigned to Pola Kasei Kogyo KK. Silicone elastomers of the type described in U.S. Pat. Nos. 5,412,004; 5,837,793; and 5,811,487, are also useful herein. Preferably the elastomers of the present invention are cured under anhydrous conditions or in an anhydrous environment. The present invention may include peraklylene hydrocarbon materials. These materials are a branched alk(en)yl material, of which the side-groups are —H, C1-4 alk(en)yl groups or (—H or C1-4 alk(en)yl) substituted saturated or unsaturated cyclic hydrocarbons, and wherein at least 10% by number of the side-groups are other than —H, more preferably from 25% to 75%, most preferably from 40% to 60%. Preferred alkyl side-groups are methyl groups. Preferably the weight average molecular weight of the per-alk(en)yl hydrocarbon material is less than about 4200, preferably from about 180 to about 2500. Such low molecular weight per-alk(en)yl hydrocarbon materials are available for example from BP under the trade name Indopol, from Soltex under the tradename Solanes and from Chevron under the tradename Oronite OLOA. It is also advantageous to control the particle size of the per-alk(en)yl hydrocarbon materials in order to maintain suitable conditioning characteristic of the composition. The combination of per-alk(en)yl hydrocarbon materials having a particle size from about 0.01μ to about 40μ and cationic deposition polymers, especially celluloses, allow for the conditioning aspects of the formula to be controlled and targeted towards a given consumer group. Through the use of low molecular weight per-alk(en)yl hydrocarbon materials, the need for large levels of expensive conditioning oils to mitigate the trade-offs traditionally associated with styling shampoos is significantly reduced. Preferred per-alk(en)yl hydrocarbon materials are polymers of butene, isoprene, terpene and styrene, and copolymers of any combination of these monomers, such as butyl rubber (poly isobutylene-co-isoprene), natural rubber (cis-1,4-polyisoprene) and hydrocarbon resins such as mentioned in the Encyclopedia of Chemical Technology by Kirk & Ohmer (3rd edition vol 8, pp 852-869), for example aliphatic and aromatic petroleum resins, terpene resins etc. Especially preferred is the use of polymers which are soluble in the low molecular weight per-alk(en)yl hydrocarbon material or other solvent or carrier, if used. m=an integer such that the weight average molecular weight of the hydrocarbon is less than or equal to 4200. These materials are available from Presperse Inc. under the Permethyl trade name. The total level of per-alk(en)yl hydrocarbon material in the hair styling composition is preferably from about 0.01% to about 10%, more preferably from about 0.2% to about 5% even more preferably from about 0.2% to about 2% by weight of the composition. The compositions of the present invention may also include hair coloring agents/dyes. Hair coloring agents/dyes useful herein include anthroquinone, azo, nitro, basic, triarylmethane, or disperse dyes, or any combinations thereof. A range of direct dyes, including basic dyes and neutral dyes are useful herein. Dyes suitable for use are described in U.S. Pat. Nos. 5,281,240 and 4,964,874. The compositions of the present invention may also contain an anti-dandruff agent. Suitable, non-limiting examples of anti-dandruff particulates include: pyridinethione salts, azoles, selenium sulfide, climbazole, particulate sulfur, and mixtures thereof. Preferred are pyridinethione salts. Such anti-dandruff particulate should be physically and chemically compatible with the essential components of the composition, and should not otherwise unduly impair product stability, aesthetics or performance. Pyridinethione anti-dandruff particulates, especially 1-hydroxy-2-pyridinethione salts, are highly preferred particulate anti-dandruff agents for use in compositions of the present invention. The concentration of pyridinethione anti-dandruff particulate typically ranges from about 0.1% to about 4%, by weight of the composition, preferably from about 0.1% to about 3%, more preferably from about 0.3% to about 2%. Preferred pyridinethione salts include those formed from heavy metals such as zinc, tin, cadmium, magnesium, aluminum and zirconium, preferably zinc, more preferably the zinc salt of 1-hydroxy-2-pyridinethione (known as “zinc pyridinethione” or “ZPT”), more preferably 1-hydroxy-2-pyridinethione salts in platelet particle form, wherein the particles have an average size of up to about 20μ, preferably up to about 5μ, more preferably up to about 2.5μ. Salts formed from other cations, such as sodium, may also be suitable. Pyridinethione anti-dandruff agents are described, for example, in U.S. Pat. Nos. 2,809,971; 3,236,733; 3,753,196; 3,761,418; 4,345,080; 4,323,683; 4,379,753; and 4,470,982. It is contemplated that when ZPT is used as the anti-dandruff particulate in the compositions herein, that the growth or re-growth of hair may be stimulated or regulated, or both, or that hair loss may be reduced or inhibited, or that hair may appear thicker or fuller. In addition to the anti-dandruff active selected from polyvalent metal salts of pyrithione, the present invention may further comprise one or more anti-fungal or anti-microbial actives in addition to the metal pyrithione salt actives. Suitable anti-microbial actives include coal tar, sulfur, whitfield's ointment, castellani's paint, aluminum chloride, gentian violet, octopirox (piroctone olamine), ciclopirox olamine, undecylenic acid and it's metal salts, potassium permanganate, selenium sulphide, sodium thiosulfate, propylene glycol, oil of bitter orange, urea preparations, griseofulvin, 8-Hydroxyquinoline ciloquinol, thiobendazole, thiocarbamates, haloprogin, polyenes, hydroxypyridone, morpholine, benzylamine, allylamines (such as terbinafine), tea tree oil, clove leaf oil, coriander, palmarosa, berberine, thyme red, cinnamon oil, cinnamic aldehyde, citronellic acid, hinokitol, ichthyol pale, Sensiva SC-50, Elestab HP-100, azelaic acid, lyticase, iodopropynyl butylcarbamate (IPBC), isothiazalinones such as octyl isothiazalinone and azoles, and combinations thereof. Preferred anti-microbials include itraconazole, ketoconazole, selenium sulphide and coal tar. Azole anti-microbials include imidazoles such as benzimidazole, benzothiazole, bifonazole, butaconazole nitrate, climbazole, clotrimazole, croconazole, eberconazole, econazole, elubiol, fenticonazole, fluconazole, flutimazole, isoconazole, ketoconazole, lanoconazole, metronidazole, miconazole, neticonazole, omoconazole, oxiconazole nitrate, sertaconazole, sulconazole nitrate, tioconazole, thiazole, and triazoles such as terconazole and itraconazole, and combinations thereof. When present in the composition, the azole anti-microbial active is included in an amount from about 0.01% to about 5%, preferably from about 0.1% to about 3%, and more preferably from about 0.3% to about 2%, by weight of the composition. Especially preferred herein is ketoconazole. Selenium sulfide is a particulate anti-dandruff agent suitable for use in the anti-microbial compositions of the present invention, effective concentrations of which range from about 0.1% to about 4%, by weight of the composition, preferably from about 0.3% to about 2.5%, more preferably from about 0.5% to about 1.5%. Selenium sulfide is generally regarded as a compound having one mole of selenium and two moles of sulfur, although it may also be a cyclic structure that conforms to the general formula SexSy, wherein x+y=8. Average particle diameters for the selenium sulfide are typically less than 15 μm, as measured by forward laser light scattering device (e.g. Malvern 3600 instrument), preferably less than 10 μm. Selenium sulfide compounds are described, for example, in U.S. Pat. Nos. 2,694,668; 3,152,046; 4,089,945; and 4,885,107. Additional anti-microbial actives of the present invention may include extracts of melaleuca (tea tree) and charcoal. The present invention may also comprise combinations of anti-microbial actives. Such combinations may include octopirox and zinc pyrithione combinations, pine tar and sulfur combinations, salicylic acid and zinc pyrithione combinations, octopirox and climbasole combinations, and salicylic acid and octopirox combinations, and mixtures thereof.sulfur are typically from about 1% to about 4%, preferably from about 2% to about 4%. The compositions of the present invention may contain a humectant. The humectants herein are selected from the group consisting of polyhydric alcohols, water soluble alkoxylated nonionic polymers, and mixtures thereof. The humectants are preferably used at levels of from about 0.1% to about 20%, more preferably from about 0.5% to about 5%. The compositions of the present invention may comprise from about 0.1% to about 10%, more preferably from about 0.2% to about 5%, and even more preferably from about 0.5% to about 3% by weight of a water soluble nonionic polymer. wherein R is selected from the group consisting of H, methyl, and mixtures thereof. When R is H, these materials are polymers of ethylene oxide, which are also known as polyethylene oxides, polyoxyethylenes, and polyethylene glycols. When R is methyl, these materials are polymers of propylene oxide, which are also known as polypropylene oxides, polyoxypropylenes, and polypropylene glycols. 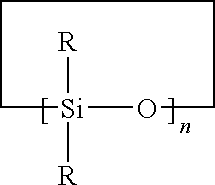 When R is methyl, it is also understood that various positional isomers of the resulting polymers can exist. In the above structure, n has an average value of from about 2,000 to about 14,000, preferably from about 5,000 to about 9,000, more preferably from about 6,000 to about 8,000. Polyethylene glycol polymers useful herein that are especially preferred are PEG-2M wherein R equals H and n has an average value of about 2,000 (PEG 2-M is also known as Polyox WSR® N-10 from Union Carbide and as PEG-2,000); PEG-5M wherein R equals H and n has an average value of about 5,000 (PEG 5-M is also known as Polyox WSR® N-35 and Polyox WSR® N-80, both from Union Carbide and as PEG-5,000 and Polyethylene Glycol 300,000); PEG-7M wherein R equals H and n has an average value of about 7,000 (PEG 7-M is also known as Polyox WSR® N-750 from Union Carbide); PEG-9M wherein R equals H and n has an average value of about 9,000 (PEG 9-M is also known as Polyox WSR® N-3333 from Union Carbide); and PEG-14 M wherein R equals H and n has an average value of about 14,000 (PEG 14-M is also known as Polyox WSR® N-3000 from Union Carbide.) Other useful polymers include the polypropylene glycols and mixed polyethylene/polypropylene glycols. The compositions of the present invention may contain a cationic polymer. Concentrations of the cationic polymer in the composition typically range from about 0.05% to about 3%, preferably from about 0.075% to about 2.0%, more preferably from about 0.1% to about 1.0%. Preferred cationic polymers will have cationic charge densities of at least about 0.7 meq/gm, preferably at least about 1.2 meq/gm, more preferably at least about 1.5 meq/gm, but also preferably less than about 7 meq/gm, more preferably less than about 5 meq/gm, at the pH of intended use of the composition, which pH will generally range from about pH 3 to about pH 9, preferably between about pH 4 and about pH 8. Herein, “cationic charge density” of a polymer refers to the ratio of the number of positive charges on the polymer to the molecular weight of the polymer. The average molecular weight of such suitable cationic polymers will generally be between about 10,000 and 10 million, preferably between about 50,000 and about 5 million, more preferably between about 100,000 and about 3 million. 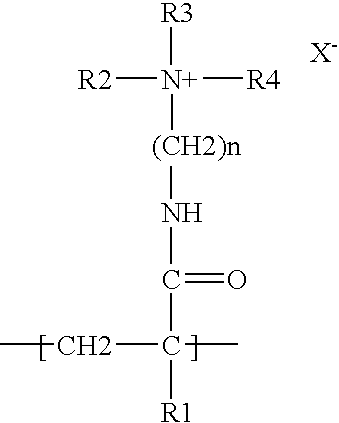 Suitable cationic polymers for use in the compositions of the present invention contain cationic nitrogen-containing moieties such as quaternary ammonium or cationic protonated amino moieties. The cationic protonated amines can be primary, secondary, or tertiary amines (preferably secondary or tertiary), depending upon the particular species and the selected pH of the composition. Any anionic counterions can be used in association with the cationic polymers so long as the polymers remain soluble in water, in the composition, or in a coacervate phase of the composition, and so long as the counterions are physically and chemically compatible with the essential components of the composition or do not otherwise unduly impair product performance, stability or aesthetics. Non limiting examples of such counterions include halides (e.g., chloride, fluoride, bromide, iodide), sulfate and methylsulfate. Non limiting examples of such polymers are described in the CTFA Cosmetic Ingredient Dictionary, 3rd edition, edited by Estrin, Crosley, and Haynes, (The Cosmetic, Toiletry, and Fragrance Association, Inc., Washington, D.C. (1982)). Non limiting examples of suitable cationic polymers include copolymers of vinyl monomers having cationic protonated amine or quaternary ammonium functionalities with water soluble spacer monomers such as acrylamide, methacrylamide, alkyl and dialkyl acrylamides, alkyl and dialkyl methacrylamides, alkyl acrylate, alkyl methacrylate, vinyl caprolactone or vinyl pyrrolidone. wherein R1 is hydrogen, methyl or ethyl; each of R2, R3 and R4 are independently hydrogen or a short chain alkyl having from about 1 to about 8 carbon atoms, preferably from about 1 to about 5 carbon atoms, more preferably from about 1 to about 2 carbon atoms; n is an integer having a value of from about 1 to about 8, preferably from about 1 to about 4; and X is a counterion. 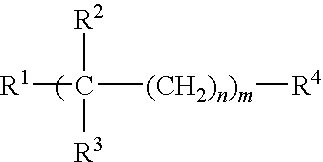 The nitrogen attached to R2, R3 and R4 may be a protonated amine (primary, secondary or tertiary), but is preferably a quaternary ammonium wherein each of R2, R3 and R4 are alkyl groups a non limiting example of which is polymethyacrylamidopropyl trimonium chloride, available under the trade name Polycare 133, from Rhone-Poulenc, Cranberry, N.J., U.S.A. Preferred cationic cellulose polymers are salts of hydroxyethyl cellulose reacted with trimethyl ammonium substituted epoxide, referred to in the industry (CTFA) as Polyquaternium 10 and available from Amerchol Corp. (Edison, N.J., USA) in their Polymer LR, JR, and KG series of polymers. Other suitable types of cationic cellulose include the polymeric quaternary ammonium salts of hydroxyethyl cellulose reacted with lauryl dimethyl ammonium-substituted epoxide referred to in the industry (CTFA) as Polyquaternium 24. These materials are available from Amerchol Corp. under the tradename Polymer LM-200. Conditioning agents include any material which is used to give a particular conditioning benefit to hair and/or skin. Suitable conditioning agents for use in the composition include the previously mentioned silicones and peralkylene hydrocarbons as well as organic conditioning oils (e.g., hydrocarbon oils, polyolefins, and fatty esters) or combinations thereof. The conditioning component of the compositions of the present invention may comprise from about 0.05% to about 3%, preferably from about 0.08% to about 1.5%, more preferably from about 0.1% to about 1%, of at least one organic conditioning oil as the conditioning agent, either alone or in combination with other conditioning agents, such as the silicones (described herein). Also suitable for use in the compositions herein are the conditioning agents described by the Procter & Gamble Company in U.S. Pat. Nos. 5,674,478, and 5,750,122. Also suitable for use herein are those conditioning agents described in U.S. Pat. No. 4,529,586 (Clairol), U.S. Pat. No. 4,507,280 (Clairol), U.S. Pat. No. 4,663,158 (Clairol), U.S. Pat. No. 4,197,865 (L'Oreal), U.S. Pat. No. 4,217,914 (L'Oreal), U.S. Pat. No. 4,381,919 (L'Oreal), and U.S. Pat. No. 4,422,853 (L'Oreal). The personal care composition of the present invention may comprise particles. Water insoluble solid particle of various shapes and densities is useful. The particle of the present invention has a particle size (volume average based on the particle size measurement described hereafter) of less than about 100 μm, preferably less than about 60 μm, and more preferably the particle size of less than about 30 μm. The interference pigments of the present invention are platelet particulates. The platelet particulates of the multi-phased personal care compositions preferably have a thickness of no more than about 5 μm, more preferably no more than about 2 μm, still more preferably no more than about 1 μm. The platelet particulates of the multi-phased personal care composition preferably have a thickness of at least about 0.02 μm, more preferably at least about 0.05 μm, even more preferably at least about 0.1 μm, and still more preferably at least about 0.2 μm. The interference pigment of the multi-phased personal care compositions comprise a multilayer structure. The centre of the particulates is a flat substrate with a refractive index (RI) normally below 1.8. A wide variety of particle substrates are useful herein. Nonlimiting examples are natural mica, synthetic mica, graphite, talc, kaolin, alumina flake, bismuth oxychloride, silica flake, glass flake, ceramics, titanium dioxide, CaSO4, CaCO3, BaSO4, borosilicate and mixtures thereof, preferably mica, silica and alumina flakes. A wide variety of thin films are useful herein. Nonlimiting examples are TiO2, Fe2O3, SnO2, Cr2O3, ZnO, ZnS, ZnO, SnO, ZrO2, CaF2, Al2O3, BiOCl, and mixtures thereof or in the form of separate layers, preferably TiO2, Fe2O3, Cr2O3SnO2. For the multiple layer structures, the thin films can be consisted of all high refractive index materials or alternation of thin films with high and low RI materials with the high RI film as the top layer. In an embodiment of the present invention the interference pigment surface is either hydrophobic or has been hydrophobically modified. The Particle Contact Angle Test as described in copending application Ser. No. 60/469,075 filed on May 8, 2003 is used to determine contact angle of interference pigments. The greater the contact angle, the greater the hydrophobicity of the interference pigment. The interference pigment of the present invention possess a contact angle of at least 60 degrees, more preferably greater than 80 degrees, even more preferably greater than 100 degrees, still more preferably greater than 100 degrees. Nonlimiting examples of the hydrophobic surface treatment useful herein include silicones, acrylate silicone copolymers, acrylate polymers, alkyl silane, isopropyl titanium triisostearate, sodium stearate, magnesium myristate, perfluoroalcohol phosphate, perfluoropolymethyl isopropyl ether, lecithin, carnauba wax, polyethylene, chitosan, lauroyl lysine, plant lipid extracts and mixtures thereof, preferably, silicones, silanes and stearates. Surface treatment houses include US Cosmetics, KOBO Products Inc., and Cardre Inc. The benefit phase may optionally comprise any component listed in the cleansing phase section herein or any component listed in the optional ingredient section herein. When the benefit phase comprises a surfactant described herein, the surfactant is selected from the group consisting of anionic surfactants, nonionic surfactants, zwitterionic surfactants, amphoteric surfactants, and mixtures thereof. The surfactant may optionally be selected from the group consisting of nonionic surfactants, zwitterionic surfactants, amphoteric surfactants, and mixtures thereof. The surfactant may be present in an amount of from about 1% to about 50%, more preferably from about 4% to about 30%, even more preferably from about 5% to about 25%, by weight of the benefit phase. The surfactant may be present in an amount of at least 8% by weight of composition of said benefit phase. The compositions of the present invention may comprise an aqueous carrier. The aqueous carrier may be found in the cleansing phase, the benefit phase, or both the cleansing phase and the benefit phase. Preferably, they comprise from about 50% to about 99.8%, by weight of water. The aqueous carrier can optionally include other liquid, water-miscible or water-soluble solvents such as lower alkyl alcohols, e.g. C1-C5 alkyl monohydric alcohols, preferably C2-C3 alkyl alcohols. The compositions herein can contain a variety of other optional components suitable for rendering such compositions more cosmetically or aesthetically acceptable or to provide them with additional usage benefits. Optional ingredients may be found in either the cleansing phase or the benefit phase. Such conventional optional ingredients are well-known to those skilled in the art. A wide variety of additional ingredients can be formulated into the present composition. These include: other conditioning agents; viscosity modifiers such as alkanolamides and methanolamides of long chain fatty acids such as cocomonoethanol amide; crystalline suspending agents; pearlescent aids such as ethylene glycol distearate; preservatives such as benzyl alcohol, methyl paraben, propyl paraben and imidazolidinyl urea; polyvinyl alcohol; ethyl alcohol; pH adjusting agents, such as citric acid, sodium citrate, succinic acid, phosphoric acid, sodium hydroxide, sodium carbonate; salts, in general, such as potassium acetate and sodium chloride; coloring agents, such as any of the FD&C or D&C dyes; hair oxidizing (bleaching) agents, such as hydrogen peroxide, perborate and persulfate salts; hair reducing agents, such as the thioglycolates; perfumes; sequestering agents, such as disodium ethylenediamine tetra-acetate; and polymer plasticizing agents, such as glycerin, disobutyl adipate, butyl stearate, and propylene glycol. Other non limiting examples of these optional ingredients include vitamins and derivatives thereof (e.g., ascorbic acid, vitamin E, tocopheryl acetate, and the like); sunscreens; thickening agents (e.g., polyol alkoxy ester, available as Crothix from Croda); preservatives for maintaining the anti microbial integrity of the cleansing compositions; anti-acne medicaments (resorcinol, salicylic acid, and the like); antioxidants; skin soothing and healing agents such as aloe vera extract, allantoin and the like; chelators and sequestrants; and agents suitable for aesthetic purposes such as fragrances, essential oils, skin sensates, pigments, pearlescent agents (e.g., mica and titanium dioxide), lakes, colorings, and the like (e.g., clove oil, menthol, camphor, eucalyptus oil, and eugenol). Other optional hair and skin benefit ingredients include carboxylic acid which is hydroxylated in the α position (which compound is also referred to as an α-(alpha) hydroxyl acid) or a derivative thereof. Acid derivatives, as defined herein, are associated salts (salts with organic bases or alkali metal, for example) or lactides (obtained, for example, by autiesterification of α-hydroxy acid molecules). Examples of such compounds are, citric acid, lactic acid, methallactic acid, phenyllactic acid, malic acid, mandelic acid, glycolic acid, benzylic acid, and 2-hydroxycaprylic acid. Additional hair and skin benefit agents include ceramides or glycoceramides. Ceramides are described in Arch. Dermatol, Vol 123, 1381-1384, 1987, or those described in French Patent FR-2,673,179; fatty acid polyesters such as, sucrose pentalaurate, sucrose tetraoleate, sucrose pentaerucate, sucrose tetraerucate, sucrose pentatallowate, sucrise triapeate, sucrose tetrapeate, sucrose pentarapeate, sucrose tristearate, and sucrose pentastearate, and mixtures thereof; polypeptides and amino acids consisting of basic amino acids, particularly arginine. The compositions optionally comprise a colorant or pigment. Preferably, the colorant comprises metal ions. Preferably, the colorant is free of barium and aluminum ions which allows for improved lamellar phase stability. The colorant preferably maintains UV stability. The colorants for use in the compositions are selected from the group consisting of organic pigments, inorganic pigments, interference pigments, lakes, natural colorants, pearlescent agents, dyes (including, e.g., water soluble, non-soluble, oil-soluble), carmines, and mixtures thereof. Non-limiting examples of colorants include: D&C Red 30 Talc Lake, D&C Red 7 Calcium Lake, D&C Red 34 Calcium Lake, Mica/Titanium Dioxide/Carmine Pigments (Clorisonne Red from Engelhard, Duocrome RB from Engelhard, Magenta from Rona, Dichrona RB from Rona), Red 30 Low Iron, D&C Red Lake Blend of Lake 27 & Lake 30, FD&C Yellow 5 Lake, Kowet Titanium Dioxide, Yellow Iron Oxide, D&C Red 30 Lake, D&C Red 28 Lake, Cos Red Oxide BC, Cos Iron Oxide Red BC, Cos Iron oxide Black BC, Cos Iron Oxide Yellow, Cos Iron Oxide Brown, Cos Iron Oxide Yellow BC, Euroxide Red Unsteril, Euroxide Black Unsteril, Euroxide Yellow Steril, Euroxide Black Steril, Euroxide Red, Euroxide Black, Hydrophobic Euroxide Black, Hydrophobic Euroxide Yellow, Hydrophobic Euroxide Red, D&C Yellow 6 Lake, D&C Yellow 5 Zr Lake, Blue # 1, Orange # 4, Red # 4, Yellow # 5, and mixtures of these colorants. To further improve stability under stress conditions such as high temperature and vibration, it is preferable to adjust the densities of the separate phases such that they are substantially equal. This is known as density matching. To achieve density matching, low density microspheres may be added to the denser phase of the composition. The low density microspheres employed to reduce the overall density of the cleansing phase are particles having a density lower than about 0.7 g/cm3, preferably less than about 0.2 g/cm3, more preferably less than about 0.1 g/cm3, even more preferably less than about 0.05 g/cm3. The low density microspheres generally have a diameter less than about 200 μm, preferably less than about 100 μm, even more preferably less than about 40 μm. Preferably, the density difference between the cleansing phase and the benefit phase is less than about 0.30 g/cm3, preferably less than about 0.15 g/cm3, more preferably, the density difference is less than about 0.10 g/cm3, even more preferably, the density difference is less than about 0.05 g/cm3, and even more preferably, the density difference is less than about 0.01 g/cm3. The microspheres are produced from any appropriate inorganic or organic material compatible with a use on the skin that is nonirritating and nontoxic. Just as low density microspheres can be added to the denser phase of the present invention to improve vibrational stability, high density materials can be added to the less dense phase to increase its density having the same impact on stability. The density of each phase is measured by a Pycnometer. Density is calculated in g/cm3. In matching densities, the densities of the two phases must not be substantially different and should preferably be within a range of +/−15%, more preferably within a range of +/−10%, even more preferably within a range of +/−5%. The personal care compositions of the present invention are used in conventional ways to provide cleansing and other benefits. Such method of use depends upon the type of composition employed but generally involves application of an effective amount of the product to the hair or skin, which may then be rinsed from the hair or skin (as in the case of hair rinses) or allowed to remain on the hair or skin (as in the case of gels, lotions, and creams). “Effective amount” means an amount sufficient enough to provide a dry combing benefit. In general, from about 1 g to about 50 g is applied to the hair, skin, or the scalp. The composition is distributed throughout the hair or skin, typically by rubbing or massaging the hair, scalp, or skin. Preferably, the composition is applied to wet or damp hair prior to drying of the hair. The composition may optionally be applied via a substrate. After such compositions are applied to the hair, the hair is dried and styled in accordance with the preference of the user. In the alternative, the composition is applied to dry hair, and the hair is then combed or styled in accordance with the preference of the user. The personal care compositions are useful in delivering conditioning benefits to hair or skin, and/or delivering hair styling benefits to hair or skin, and/or delivering hair coloring benefits to hair or skin by topically applying an effective amount of the composition onto hair or skin and rinsing said hair or skin with water. For some applications, the rinsing step can be optional. The personal care compositions of the present invention may be prepared by any known or otherwise effective technique, suitable for making and formulating the desired product form. It is especially effective to combine toothpaste-tube filling technology with a spinning stage design. Specific non-limiting examples of such methods as they are applied to specific embodiments of the present invention are described in the following examples. The compositions illustrated in the following Examples exemplify specific embodiments of the compositions of the present invention, but are not intended to be limiting thereof. Other modifications can be undertaken by the skilled artisan without departing from the spirit and scope of this invention. The cleansing phase and the benefit phase are prepared separately. The compositions illustrated in the following Examples are prepared by conventional formulation and mixing methods, an example of which is described above. All exemplified amounts are listed as weight percents and exclude minor materials such as diluents, preservatives, color solutions, imagery or conceptual ingredients, botanicals, and so forth, unless otherwise specified. In an appropriate vessel, add distilled water and stir at an appropriate speed (100-200 ppm) using an appropriate sized stir blade. If needed, add the anionic polymer (Carbopol Aqua SF-1), or cationic polymers (N-Hance 3196, Polyquaternium-10, Polycare 133) and stir briefly and slowly to wet and disperse the polymer. While continuing to stir, if needed, add the citiric acid solution (50%) drop wise to the mix vessel to reduce pH until solution becomes clear. Add surfactants (AS, AES, CAPB, and AO) to the mixture. Heat the mixture to 60° C. and while stirring add CMEA, EGDS, and Cetyl alcohol to the mixture. Mix until homogeneous. Cool the solution to room temperature while stirring and add Dimethicone, EDTA, Mackstat DM-C, D&C pigment, and perfume. Finally, adjust pH of the product within the preferred specified range of from about 5.5 to about 6.5. Where required, Laponite XLS is added to the solution (heated to 40° C.) and the solution is heated to 60-65° C. prior to the addition of surfactants. Into an appropriately sized and cleaned vessel, add distilled water and stir at 200-300 rpm by using an appropriate laboratory stirrer. Slowly add Stabylen 30 and mix until homogeneous. Weigh the appropriate quantity of Keltrol CGT and slowly add it to the mix. Stir until homogeneous. Into a second vessel add surfactants (CAPB, AO) and begin stirring and heating to 60° C. After stirring briefly, add CMEA. Add the phase containing Stabylen 30 and Keltrol CGT to the surfactant phase. Add Triethanolamine while stirring. Add remaining ingredients and adjust pH within the specified range of from about 5.5 to about 6.5. Density match the cleansing and benefit phases within 0.05 g/cm3. Combine these phases by first placing the separate phases in separate storage tanks having a pump and a hose attached. Then, pump the phases in predetermined amounts into a single combining section. Next, move the phases from the combining sections into blending sections and mix the phases in the blending section such that the single resulting product exhibits a distinct pattern of phases. Next, pump the product that was mixed in the blending section via a hose into a single nozzle into a spinning container, and fill the container from the bottom to the top with the resulting product. Both the cleansing phase and benefit phase compositions are made according to the general procedure described for examples 1 to 3. The following compositions may be prepared using conventional formulation and mixing techniques. Where melting or dissolution of solid surfactants or wax components is required these can be added to a premix of the surfactants, or some portion of the surfactants, mixed and heated to melt the solid components, e.g., about 72° C. This mixture can then optionally be processed through a high shear mill and cooled, and then the remaining components are mixed in. Thickening ingredients should be added according to manufacturer's instructions. Often this involves making a premix in water which is then added to the main mix and, if necessary, adjusted for pH to achieve full thickening performance. Silicone emulsions can be added directly to the compositions, while non-emulsified silicones must first be emulsified to the desired particle size in a premix of surfactant with salt for viscosity control. Water q.s. q.s. q.s. q.s. q.s. q.s. q.s. wherein said cleansing phase and said benefit phase form a visible pattern or arrangement that is unchanged for a period of at least about 180 days, when said cleansing phase and said benefit phase sit undisturbed in physical contact with one another at ambient conditions. 2. The multi-phase personal care composition of claim 1 wherein said surfactant is selected from the group consisting of anionic surfactants, nonionic surfactants, zwitterionic surfactants, amphoteric surfactants, soap, and mixtures thereof. 3. The multi-phase personal care composition of claim 1 wherein aid at least one aqueous benefit phase further comprises at least one benefit agent selected from the group consisting of anti-dandruff actives, humectants, water soluble nonionic polymers, cationic polymers, conditioning agents, and particles. 4. The multi-phase personal care composition of claim 1 wherein aid at least one aqueous benefit phase further comprises at least one surfuctant. 5. The multi-phase personal care composition of claim 1 wherein aid at least one cleaning phase and aid at least one aqueous benefit phase are visually distinct phases due to inclusion of a colorant in aid at least one cleansing phase, in aid at least one aqueous benefit phase, and/or in both of aid at least one cleansing phase and aid at least one aqueous benefit phase. 6. The multi-phase personal care composition of claim 1 wherein aid visually distinct phases form a pattern selected from group consisting of striped, geometric, marbled, and combinations thereof. 7. The multi-phase personal care composition of claim 1 wherein the density difference between said at least one cleansing phase and said at least one aqueous benefit phase is less than about 0.30 g/cm3. 8. The multi-phase personal care composition of claim 1 wherein the viscosity of said at least one cleansing phase and said at least one aqueous benefit phase arc in the range of from about 10,000 to about 200,000,000 centipoise at stress measurements of from about 1 to about 20 pascals at about 25° C.
9. The multi-phase personal care composition of claim 1 wherein the viscosity of said at least one cleansing phase and said at least one aqueous benefit phase are in the range of from about 100,000 to about 100,000,000 centipoise at stress measurements of from about 1 to about 20 pascals at about 25° C.
10. The multi-phase personal care composition of claim 1 wherein said surfactant in the cleaning phase further comprises Lauryl Pyrrolidone surfactant. 11. The multi-phase personal care composition of claim 1 further comprising a water-soluble dye in said at least one cleansing phase and/or said at least one aqueous benefit phase. 12. The multi-phase personal care composition of claim 11 further comprising a non-soluble dye in said at least one aqueous benefit phase. 13. The multi-phase personal care composition of claim 1 further comprising a non-soluble dye in said at least one aqueous benefit phase. b) optionally rinsing said hair or skin with water. b) rinsing aid hair or skin with water. b) optionally rinsing aid hair with water. MX2014001896A (en) * 2011-08-15 2014-05-27 Procter & Gamble Personal care methods. PCT International Search Report dated Mar. 6, 2006, 12 pages. U.S. Appl. No. 07/758,319, filed Aug. 27, 1991, Bolich, Jr. et al. U.S. Appl. No. 07/758,320, filed Aug. 27, 1991, Torgerson et al. XP 002332778 "Dove All Day Moisturizing Body Wash" Online URL: http://www.ewg.org/reports/skindeep2/report.php?type=PRODUCT&id=8801874, Apr. 2005. XP002332779 "Olay Daily Renewal Moisturizing Body Wash" Online URL: http://householdprdoucts.nlm.nih.gov/cgi-bin/household.brands?tbl=brands&id=16003084, Feb. 8, 2006. ES2230043T3 (en) 2005-05-01 Cosmetic compositions containing detergent a particular amphoteric starch and uses thereof.